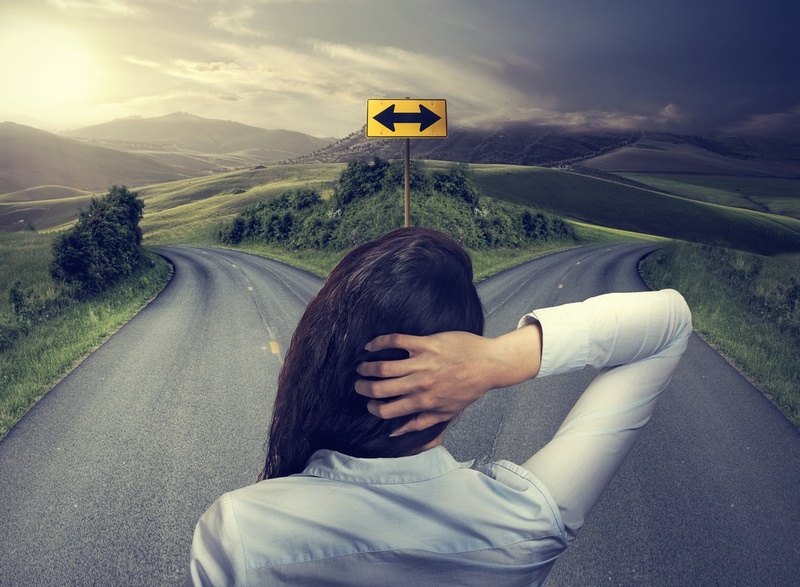 Torn between two business diplomas? Can't decide between several training options? You're definitely not alone. Business is such a broad field—there are so many career paths you could take, and so many business programs to choose from. Over the years, we've trained thousands of business students. And they come from all backgrounds, age groups, and walks of life. There's no one, "ideal" business student. Business programs attract everyone—from recent high-school grads and people changing careers later in life—to moms heading back to work, and newcomers to Canada. This is one of the most flexible college programs out there. So...how should you invest your precious time and money? Which business diploma makes the most sense for you? Work through these 5 steps, and you'll be much closer to finding your path, and starting a career you'll love. Let's get started. 1. What are your basic needs as a business student? Tackle the practical things first. Think about your basic needs, in terms of training, cost, time, and flexibility. Length: Do you have time to spend 2 (or more) years on training? Or do you need a business diploma that takes 12 months or less to complete? Costs: How much are you able to spend on training? Do you qualify for financial aid, grants, or scholarships to help with tuition? Study format: Are you looking for online business training? Do you prefer to learn on-campus? Your answer will automatically eliminate some options. Flexibility: Do you need a part-time business program, so you can balance school with work and/or family? Make a short list of your top priorities. This step will help you narrow down your options, based on your basic needs as a student. If you have one or two colleges in mind already, take a look at the business programs they offer. Then look at the career options for each of those programs. Which career paths interest you most? If you want to keep your options open, and train for a range of different business roles, it makes sense to consider the Business Administration Diploma. On the other hand, if you're really only interested in the finance side of business, you might as well get right to the point, and take Accounting training. You don't need to learn about marketing, office management, or sales. The bottom line: Where do you want to be 2-3 years from today? What kind of work environment, and role, do you want to be in? Work backward from there, and look at business programs that will lead you toward your goal. Interested in a few business programs, and wondering if you've got the right skills to succeed in training, and start a successful career? Rank your "business" strengths and weaknesses for each program/career you're considering. Think about where your strengths lie. Dig deeper by looking at the course list for each business diploma you're considering. See what kinds of skills you'll be learning, and think about whether you're excited to dive into those topics. It's always a good idea to research demand for the business careers you're interested in. Are there jobs in those fields? How difficult will it be to land your first position after business college? When you're looking at investing in business training, this is a really important factor to consider. There are a few different places you will find this information. 1. Government of Canada Job Bank. The Job Bank lists the career forecast for thousands of jobs, in every region of the country. Type in the positions you're considering, and get the latest salary and outlook report for your city. Here's a good example for Accounting Clerk in the Montreal area. 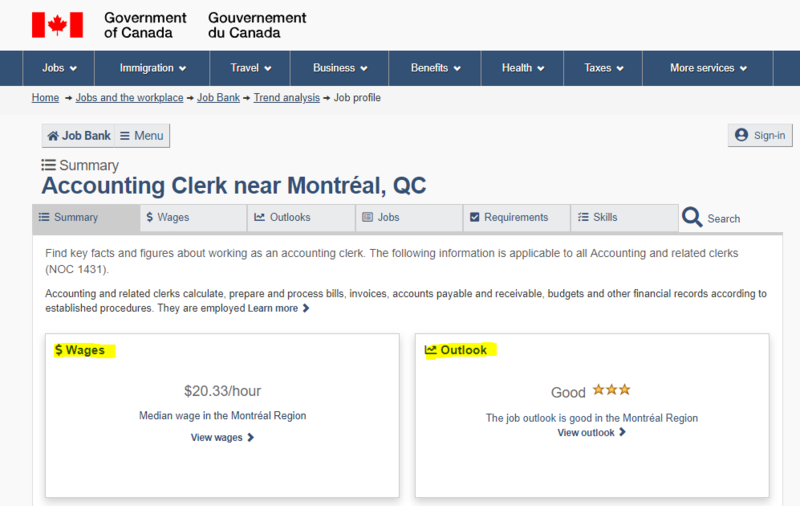 We can see the outlook is "good' ( 3 stars), and the median wage for this position is about $20/hour. Click to explore other career paths with the Job Bank Career Exploration Tool. 2. Look at graduate employment rates for each business program. Find out what percentage of graduates get hired, after finishing the business programs you're considering. Known as "graduate employment rates", this data can tell you a lot about local demand, and the quality of the training program. At Herzing, for example, we publish graduate employment rates for each one of our business diplomas. You can find the information on our website. Here's a look at the most recent data, from our International Commerce & Import/Export page. 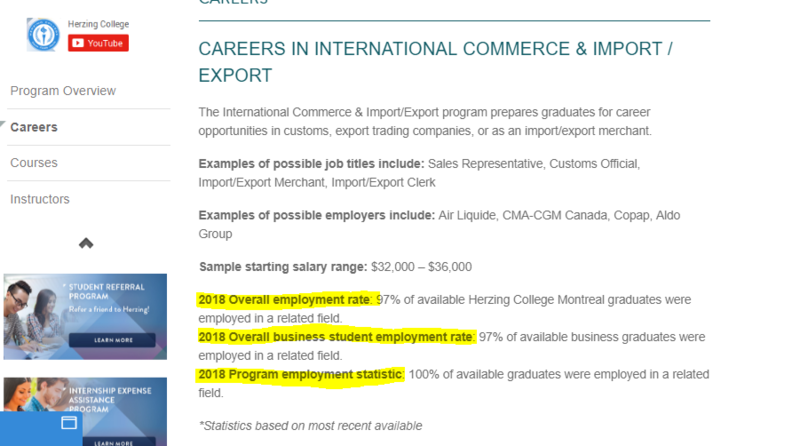 You'll see employment rates for the whole of Herzing Montreal; the business department; and the International Commerce Program. So, let's say you've gone through all these steps, and you have one or two programs you're really interested in. Your next and final step is to book a meeting with an Admissions Advisor at the business colleges you're considering. Advisors are experts in matching people with programs. They will ask you questions about your career goals, strengths, and learning needs to help you confirm which business diploma is your perfect fit. After your meeting with an Admissions Advisor, you'll know if the program—and college—is right for you. And you can proceed with confidence, toward your brand new career! Still have questions? Looking for more information? We're here to help. 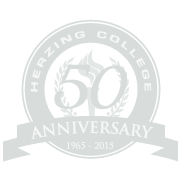 Use the link below to explore available Business Programs at Herzing College Montreal. You can browse courses and careers, chat live with an Admissions Advisor, take our Career Training Readiness Quiz, and much more.